DITEK's residential surge protectors safeguard your home against transient surges that can destroy vulnerable HVAC systems, air handlers, pool pumps and household appliances. DITEK's DTK-120/240CM+ is a multi-purpose surge protection device ideal for protecting HVAC condensers, pool or well pumps, motors and incoming utility power. DITEK's DTK-120/240HD2 100kA surge protective device (SPD) is designed to protect 120/240Vsplit phase electrical panels. Ideal for residential or small commercial buildings. DITEK's DTK-1F is a single outlet surge protector that provides AC power protection for alarm panel transformers and point of use appliances. 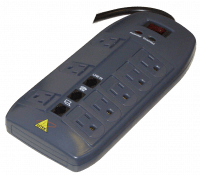 DITEK's DTK-1FF is a single outlet surge protector that provides AC power and telco protection for alarm panel transformers, fax and answering machines. DITEK's DTK-3VWMUSB is a three outlet charging station with load sensing technology. Illuminated load-status indicators for each level of load status. DITEK's DTK-7VS is a seven outlet power strip with load sensing technology, and illuminated load-status indicators for each level of load status. Protect AC power and telco/fax lines with DITEK's DTK-8FF eight outlet plug-in surge protector. Accepts up to six transformers at the same time. The DTK-BU600PLUS combines robust surge protection with line-interactive battery backup for optimal protection. 600VA with 7-outlets, RJ11 modular jack and 6' cord. Flush-mount Kit for DTK-120/240SA and DTK-120/240HD. DITEK's DTK-HVACKIT surge protection kit includes one DTK-120/240CM+ for HVAC condenser protection, and one DTK-4LVLPLV to protect thermostat control wires at air the handler. DITEK's DTK-240/480CM+ is a multi-purpose surge protection device ideal for protecting highway and parking lot lighting. DITEK's DTK-120/240SA 100kA surge protection device is ideal for use on 120/240VAC residential meter panels. Designed for residential or small commercial buildings.